Carbis and Gwidden are both ground-floor apartments, but their slightly elevated position gives them views across the park and out to sea. 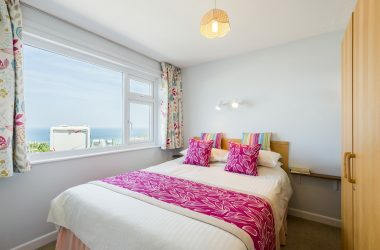 Each sleeps up to four guests, in a double and a twin bedroom. 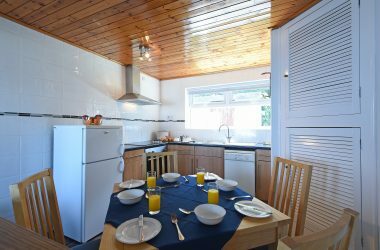 A light and comfortable sitting room, a well-equipped dining kitchen and a shower room complete these appealing apartments. Like our camping guests, you can use the swimming pool and sauna at The Garrack Hotel for a small charge – and if you fancy a night off cooking, pop up to the restaurant or café bar! You can, of course, use all the park’s facilities. All bed linen is included, and you can hire towels for £4 per set. We regret that pets and smoking aren’t allowed in the apartments (and we reserve the right to charge guests towards the cost of cleaning if these rules aren’t adhered to). 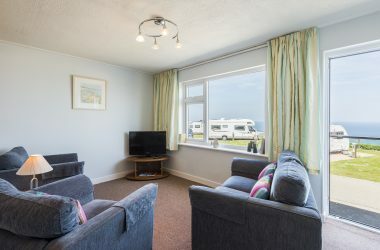 However, if you want to bring your dog to Ayr, several of the static caravans are dog-friendly. Parking for Carbis and Gwidden is available outside the apartments. Or please call Reception and book over the phone. The number is 01736 795855. We’ll provisionally hold your booking for seven days to give you time to send us your deposit. When we receive your deposit, we’ll send you a confirmation. Please pay the balance of payment 28 days before your arrival (or as soon as possible if this is a late booking).